An action view is an action that provides rich functionality within the app bar. 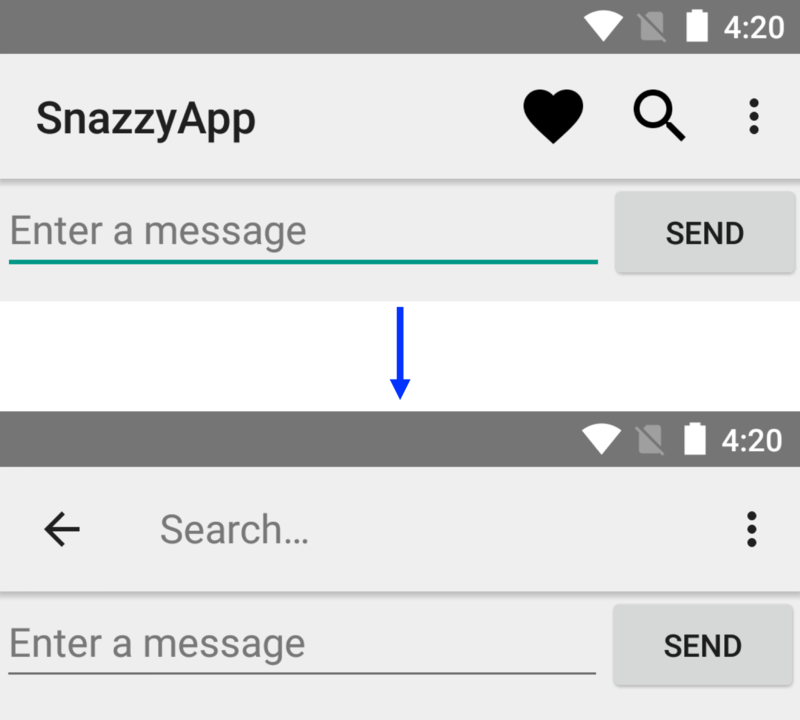 For example, a search action view allows the user to type their search text in the app bar, without having to change activities or fragments. An action provider is an action with its own customized layout. The action initially appears as a button or menu item, but when the user clicks the action, the action provider controls the action's behavior in any way you want to define. For example, the action provider might respond to a click by displaying a menu. The Android support libraries provide several specialized action view and action provider widgets. For example, the SearchView widget implements an action view for entering search queries, and the ShareActionProvider widget implements an action provider for sharing information with other apps. You can also define your own action views and action providers. actionViewClass: The class of a widget that implements the action. actionLayout: A layout resource describing the action's components. Set the showAsAction attribute to either "ifRoom|collapseActionView" or "never|collapseActionView". The collapseActionView flag indicates how to display the widget when the user is not interacting with it: If the widget is on the app bar, the app should display the widget as an icon. If the widget is in the overflow menu, the app should display the widget as a menu item. When the user interacts with the action view, it expands to fill the app bar. If the user is not interacting with the widget, the app displays the widget as the icon specified by android:icon. (If there is not enough room in the app bar, the app adds the action to the overflow menu.) When the user taps the icon or menu item, the widget expands to fill the toolbar, allowing the user to interact with it. Figure 1. When the user clicks an action view's icon, the view's UI fills the toolbar. If the action's <item> element has a collapseActionView flag, the app displays the action view as an icon until the user interacts with the action view. When the user clicks on the icon, the built-in handler for onOptionsItemSelected() expands the action view. If your activity subclass overrides the onOptionsItemSelected() method, your override method must call super.onOptionsItemSelected() so the superclass can expand the action view. To declare an action provider, create an <item> element in the toolbar's menu resource, as described in Add Action Buttons. Add an actionProviderClass attribute, and set it to the fully qualified class name for the action provider class. In this case, it is not necessary to declare an icon for the widget, since ShareActionProvider provides its own graphics. If you are using a custom action, declare an icon. For information about creating a custom action provider, see the ActionProvider reference. For information about configuring a ShareActionProvider, see the reference for that class.